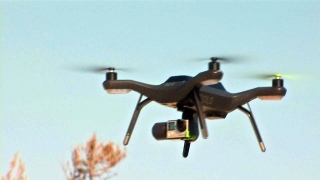 File image of drone flying. On the same day that the FAA released new rules softening drone regulations, Stanford University penned its own updated piece of legislation. The Peninsula university's new rules stipulate that third parties unaffiliated with the school are not allowed to fly the unmanned flying vehicles from or above campus grounds while Stanford community members must coordinate with a recently established committee to schedule approved flights, according to Stanford News. Stanford's new flying committee will "serve as a single, streamlined resource for reviewing proposed flights," as reported by Stanford News. Larry Gibbs, associate vice president for environmental health and safety, told Stanford News that the updated regulations were designed to benefit everyone that has a stake in the Stanford community. "We want to support the safe use of UFVs for university research, education and business purposes," he said. "We also want to provide a reasonable process that actively addresses the safety, regulatory compliance, risk management and privacy considerations that arise from UFV flights over Stanford lands. The policy seeks to do both." Members of a Stanford hobbyist club will not need to seek approval from the committee if they plan to fly model aircrafts, according to Stanford News. Those individuals are allowed to fly in pre-approved regions around the campus. Stanford, utilizing the opinions of several stakeholders while drafting this new addition to the handbook, cited privacy concerns and safety hazards as its reasoning for enacting the redesigned statutes, as reported by Stanford News.